Steam engine watercolour painting by Elaine Jones. 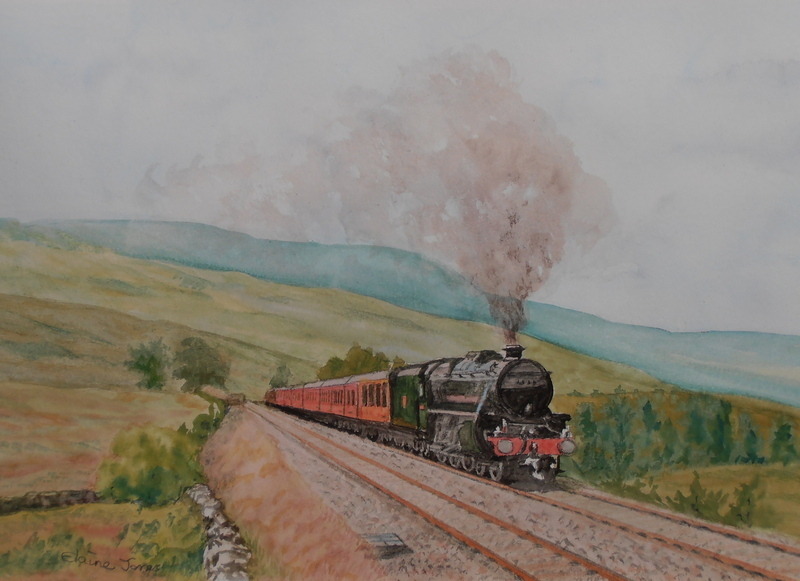 It's full steam ahead for this Stanier "Black Five" as it approaches Ais Gill summit, the highest point on the Settle-Carlisle railway at 1169 ft above sea level. The London Midland and Scottish Railway's Class 5 4-6-0, generally known as the "Black Five", is a class of steam locomotive introduced by William Stanier in 1934. Over 800 were built between then and 1951. Members of the class survived to the last day of steam in 1968, and eighteen are still preserved.